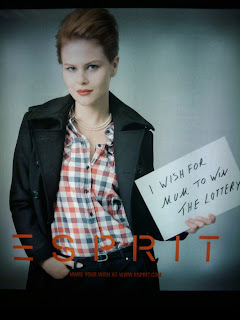 This month the fashion company ESPRIT started an ad campaign in which models tell us what they are "wishing for" this Christmas. How do we know what they want? 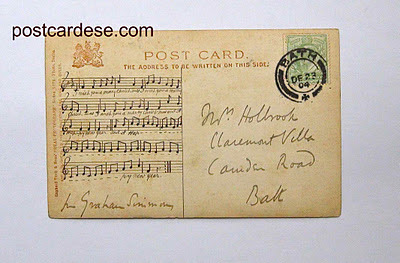 They've written it on pieces of card. They've held these cards up. And then they've looked at us... down the lens of a camera. Self-captioned portraits. If you like. The messages are messy and clear. Messy - to make us feel like they are spontaneous, and therefore genuine. Clear - to make sure we can read them when we're waiting for the bus. Even putting aside the banality of the wish list - lottery wins, "real happiness" and "harmony with nature" - the campaign has really irked me. I know when you analyse advertising, it can make you cross. An advert is only successful if it makes you feel short of something. And admen/women will use all the tricks in their books to give you a desire itch. But this campaign has crossed the line... it's mangled the work of an artist I really like. That of Gillian Wearing. Not that using elements of others' work is in itself always bad, of course. 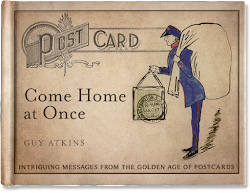 I admit Wearing's work was an influence on the images I took of the "postcard tour" I did at a bookshop in May. But if done badly or for a dubious motive, there's a risk the original artwork itself is undermined. Classical music has been an obvious victim of this. Listen to a Puccini opera and at some point you'll inevitably find yourself thinking about buying a new car or, worse still, renewing your home insurance. In particular, ESPRIT's campaign brought to mind: Wearing's “Signs that say what you want them to say and not signs that say what someone else wants you to say”; the Volkswagen advert that Wearing suggested was based on her work; and DHL's fanverts at the Rugby World Cup in New Zealand this year - where fans were encouraged to hold up handwritten messages on boards, framed with DHL logos. For her piece, Wearing approached strangers in public spaces, and asked them to write a spontaneous message on an A3 piece of paper. She then took a photo of them holding the paper. Below is one of the first photos in the series. 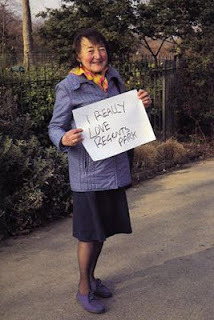 It shows a woman holding the message “I REALLY LOVE REGENTS PARK”. With it, Wearing skillfully counters the notion that when it comes to looking at photos ‘you can no longer trust your eyes'. The woman is photographed in a park, suggesting a chance encounter between photographer and subject. To create a credible narrative across the series of photos, Wearing uses the same white paper and black marker pen in each, making visible the process of her arranging the photoshoots - you can picture Wearing approaching the volunteers and asking them to join in her project. In each photo, the direct gaze into the camera gives the impression the individual is content to be photographed in this way; they are fully aware of what is going on. 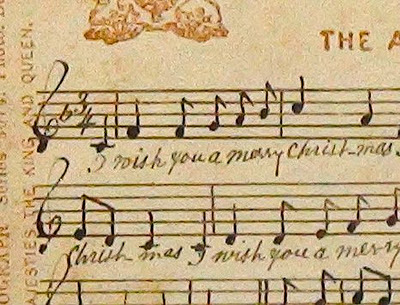 And having written the message themselves, they have been given more than a bit of control over how the photo will be read by those that see it. With 'authenticity' established, the photos make us believe in the people in the photos. For ESPRIT, I guess they want us to think the same of their images. These people are real. Their views are real. Their love of ESPRIT is real. There is a problem though for ESPRIT. And it stems from not letting anything interesting or confusing be written on the boards. If applying Wearing's techniques has made us believe in the people photographed and all they've written are trite, empty 'wishes', then aren't we simply left convinced that the brand is for people who themselves are genuinely boring? PS Don't worry, I'll cheer up for Christmas! 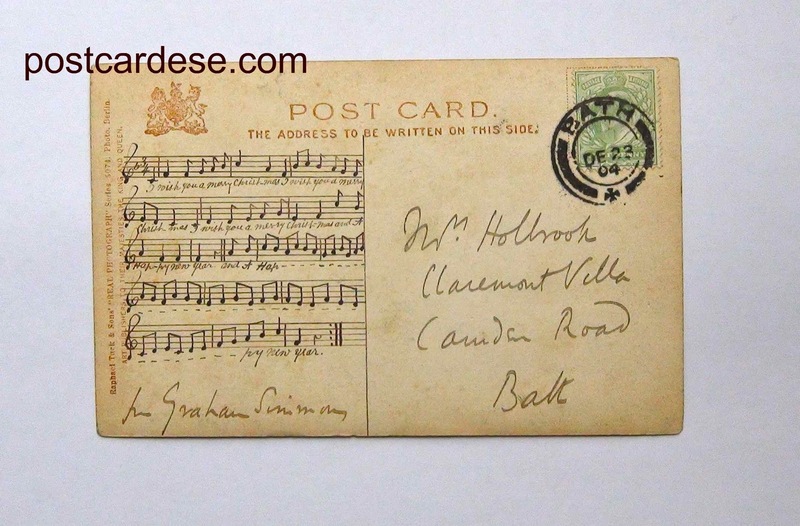 And on the next post I'll have an update on the Japanese postcard from last week. Am very excited about this. Thanks to Rupert and Fuyu for sending in their translations. 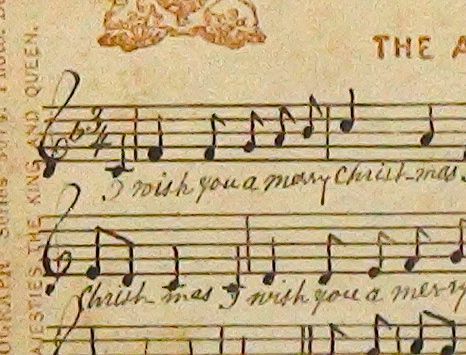 Plus, I have a great card with which to wish you a Merry Christmas.